Star Wars Episode 7 RTG 16 oz. Plastic Travel Mug:From the long-awaitedStar Wars: Episode VII - The Force Awakens! Take hold of power and use it to Rule the Galaxy with Kylo Ren and the First Order. This Star Wars: Episode VII - The Force Awakens Kylo Ren Rule the Galaxy 16 oz. 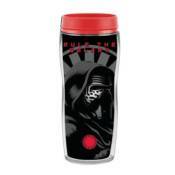 Curved Plastic Travel Mug features a menacing image of villain Kylo Ren with the Power logo and the words, "Rule the Galaxy." Holds up to 16 ounces of liquid. Hand wash only. Not dishwasher safe. Do not microwave.